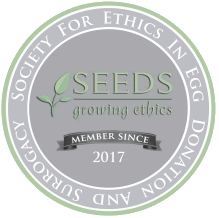 Potential egg donors are carefully evaluated prior to entering the program. Each candidate donor is submitted to an intense medical and psychological	screening. Our objective here is simple: we want to help you become a	family using the healthiest individuals we can find. Donors begin the process by filling out an in-depth health history questionnaire. This form is used to ask detailed questions about a donor’s health,	diet, and other habits. We explore the donor’s ethnic and religious	heritage, and her family history of medical illnesses going back three	generations. This information remains on permanent file with the program,	providing couples with access to their egg donor’s family medical	history should the need arise to treat an illness later in their child’s life. Laboratory testing is an essential part of the donor evaluation. At her	initial clinic visit each donor receives a complete physical exam, gonorrhea	and chlamydia smear. Although we believe that it is nearly impossible	to transmit diseases through the egg donation procedure, we take extreme	care to make sure that the donor is free of infectious diseases. Each	donor is also tested for hepatitis, syphilis, and HIV. Hormonal tests	are used to assess the donor’s endocrine system. Special testing	may be ordered for donors at the physician and couples request. Chromosomal	testing is available for certain genetic disorders. **Donors with a history of significant drug or alcohol abuse are automatically	excluded from consideration for the program. A comprehensive independent psychological interview is essential. An experienced	psychologist that considers many aspects of the donor’s mental health	has personally screened each of our donors. The psychologist’s main	goal is to make sure that the donor is reliable individual who may be	counted upon to fulfill all of her responsibilities during the course	the cycle. It is important, to minimize the chance that she will have	regrets or psychological problems as a result of her participation. Additionally,	we strive to exclude the presence of major psychiatric diseases such as	chronic depression, schizophrenia, or manic-depressive disorder that could	be inherited by the child. We also want to rule out the presence of a	past history of childhood or spousal abuse or other problems, which might	adversely affect the donor’s ability to participate. Each donor is screened by a board certified genetic counselor. Each couple	receives a copy of the genetic report on their donor. The report includes	the genetic make-up of the donor in order to minimize the chances of birth	defects or serious inherited diseases. Recommended testing will be listed	on the report. A three-generation pedigree will evaluate the donor’s	family history for genetic risks.